This stunning quilt kit features Hoffman Bali Hand-dyed fabrics pre-cut for applique onto the digital-print panel Supernova by Jeanie Sumrall-Ajero. (DIGITAL PANEL IS NOT INCLUDED.) Quilt kit includes hand-dyed fabrics that are pre-cut and pre-fused. Customer adds Supernova panel in color of her or his choice. Finished size is 40″ square. 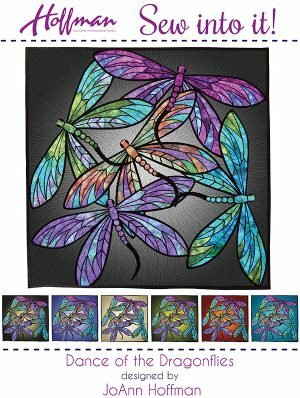 Dance of the Dragonflies quilt design and instructions by JoAnn Hoffman.